The council tax increase will see a Band D bill rise by £57.03 to £1,324.33. Meanwhile, council tax in Orkney will rise by 4.79% - a £53 rise for a Band D property, to £1,153. 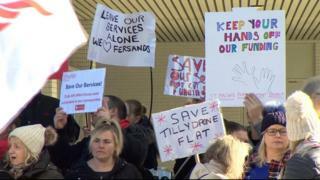 A large protest at the potential cutbacks to services was held outside Aberdeen City Council ahead of the meeting. Council co-leader Douglas Lumsden proposed the council tax rise of 4.5%, lower than the maximum allowable 4.79%. However, the SNP proposed a council tax rise of 3%. Mr Lumsden said community centres and school crossing patrollers would be safe. Cuts to libraries and public toilets were also avoided. He committed to funding the redevelopment of historic Union Terrace Gardens (UTG). The SNP proposed £3m of UTG improvements, rather than the full £25m renovation. In Orkney, as well as the 4.79% council tax increase, charges for most council services will increase by 3%. The budget setting meeting had been postponed from the end of last month awaiting confirmation on funding from the Scottish government for internal ferry services. It was confirmed the council would receive £5.3m, and councillors voted to increase ferry fares by 3%.